I get to experience the happiest feelings of my childhood all over again, but through their eyes. So I get a double-dose of happiness: I get to remember the good times I had and I get to see the people I love more than anything in the world experience it, too. Most often, I get to provide those experiences and it's the best, ever! I absolutely love being a Mommy, because it just keeps getting better and better. Just when I thought I couldn't be any prouder, or my heart couldn't possibly hold any more love, my two little favorites do something completely new that leaves me in awe all over again. I am completely lucky to be called Mommy! 1. There's no going back! The sleep, the freedom to just get up and go, even eating chocolate for breakfast (they always see you) and privacy!!! But I don't even remember those moments because it literally feels like Adie and Aden have been apart of me for my entire life! And that's how I know, this is what I am supposed to be doing ... being a Mama! 2. At the end of the day, when you are beating yourself up for all the things you didn’t do, and all the things you wish you hadn't done, stop. Stop and start to list the blessings. Every single day we have with our children is a gift. Even the bad stuff, is wonderful. Even the messy and the crazy and the awful and the gut wrenching, is beautiful. This, more than anything else, has been my greatest lesson as a Mama so far. 3. We literally loose ourselves in doing everything for our children (and husbands) especially at the beginning stages of being a Mama. I literally live in sweats more days than I actually get ready and it makes Eric crazy! :) I can get ready in an hour with no interruptions but with my two little people its more like four hours and then it's Aden's nap time! Nothing like trying to curl your hair when Aden is pulling the cord and Adie is demanding more orange juice. But those days I finally do get ready ... it's a game changer! Don't feel guilty for doing something for yourself (this one is hard for me) because you are totally worth it. 4. I don't have to yell to make my kids listen! 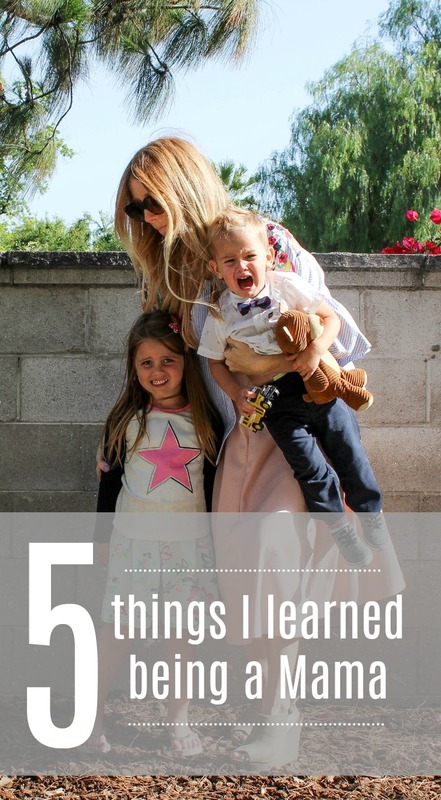 From very early on we have always explained everything to Adie and Aden. I always give them options and the most common phrase is, "good girls get good things!" Aden isn't in that stage yet of understanding but he does have the best manners EVER! Plus Mama's can literally fix anything with a kiss and hugs are like magic, even for me! 5. To simply enjoy these moments that tend to go by too quickly! I have to remind myself daily that these are the days of our lives! Eric and I were just talking about how fast Aden grew up which makes Adie look even more grown up! Like teenager grown up! To create the magic, make the memories and simply to love the crap out of them! Happy Monday and cheers to celebrating being Mamas! -XO!